In 1973-74, working as a scenic designer in Mexico City, I earned extra money dubbing movies on Saturday mornings. A group of us English speakers would meet at a studio to serve as vocal “extras”. All the main scenes had been dubbed by the pros, and we were there to fill in the bit parts. We would be given our lines, see a quick preview, and they would play the scene while we said lines like “I didn’t do it”. We never knew the plot, the motivation or the title of the movie. Some people have that kind of relationship with their food. Cooking is not a family experience, shopping is like speed dating, and the garden is a decoration. Does it matter that the food you ate was unhappy, tortured, polluted, in poor soil, grown by an exploited farm hand, cooked and served by people disappointed with their jobs and eaten alone in a car with the dinner conversation on a cell phone? Food is a glue for a society. When we get together, it is around food. I met a man named Gerardo Marin from the group Rooted in Community. He told the story of his grandmother making molé. It took a long time to make the meal. Her recipe had 52 ingredients, each with their own story. The day long process produced food, conversation and a connection to that meal through family history. I grew up eating out of our family garden. We all snapped “greasy beans” together from seeds that had been saved for generations. I still grow those same beans and cook them the same way my grandmother did. 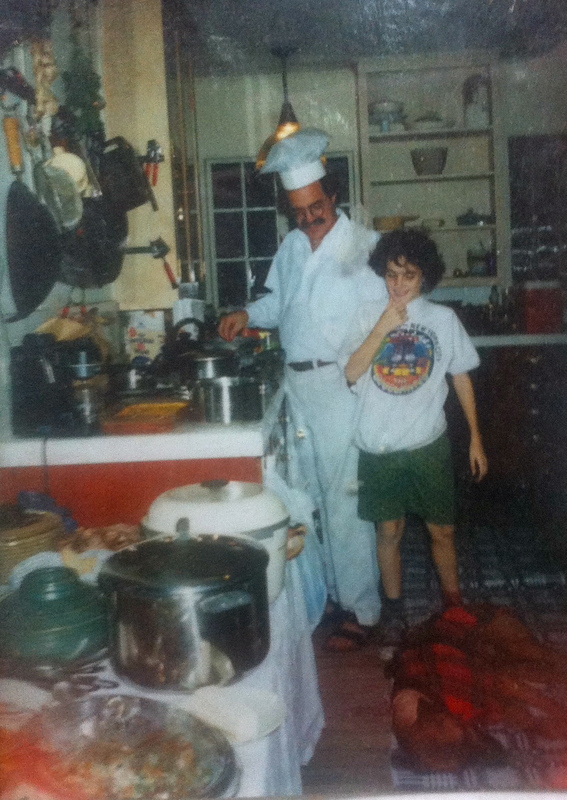 Food at our house has always been about knowing where the food came from, knowing it was handled with love, cooked with conversation and eaten as a family who was happy to be part of the story. The last time I saw my grandmother at her home she was 95 and making grape juice from the grapes she had picked that morning. She was straining the boiled and crushed grapes through a cloth that was tied to a broomstick, suspended between two ladder-back chairs. When I think of Thanksgiving, I think of Dylan, Brett, Kenan and me spending the entire day in the kitchen together. Life is too short for fast food. I can’t miss out on the fun, the companionship, the meaning, and the memories. It would be like making movies without a plot.